Is it really possible to make money online with network marketing? Well, there has been a recent boom during the last 5 years or so with more and more network marketing companies coming online. This explosion has boosted the mlm industry to new heights, and has done alot to give long overdue credit to the industry. Long gone are the days of recruiting (“pestering”) friends, family and colleagues to join the next “big opportunity”. Although, face to face sponsorship is still an effective means of growing your business, we no longer face those limits. Now, today’s network marketer has the entire world available at his or her own desktop. 1) How old is the company? The older the company is, generally means more stability. However, companies that are 10 years or older, generally are more saturated. This usually means it is difficult to grow a decent organization. Companies that are brand new (6 months to 1 year) are generally easier to grow, but they have yet to prove they can hold their own in the market. The key is to look for a company that is atleast 2 years old, but not over 10 years. 2) What is the product? Does the company have a unique product or idea, or is it just the same old thing that others are marketing. The mlm industry has more nutritional products than I can count, and it seems every week someone releases the latest “miracle juice” that “cures everything”. Personally, I have found that nutritional products have run their toll. And actually, physical products in general can be more of a pain than they are worth. There are too many variables when dealing with physical products. You have production costs, shipping costs, taxes. Sometimes you can’t grow your organization outside your home country, due to customs laws. What about out of stock issues? Back orders? If we are using the power of the internet to market our business, doesn’t it make sense to utilize that same technology for the product itself? My personal preference is digital products and services (for example, domains and web hosting), that can be delivered worldwide, instantly. 3) What is the commission plan? To make money online with network marketing, it is imperative that the commission plan be simple, easy to understand, easy to duplicate and above all, easy to explain. There are several types of commission plans being used today in mlm. However, the easiest to understand and explain is know as the “unilateral” or “unilevel” system. In the unilateral system, a distributor is paid based upon the performance of his or her directly sponsored members (their “first level” or “front line”) as well as the performance of their front line’s sponsored members, and so on, for a set number of levels. For example, a 5 level unilateral system would pay the distributor based on downline members 5 levels deep. 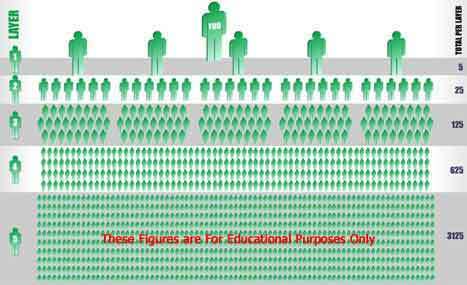 The figure below illustrates the potential growth of a 5 level system, where every member sponsors 5 members each. By adding up all 5 levels, the total number of people in this organization comes to 3905. Most unilevel systems come with an additional plus: unlimited width. This means you can actually sponsor as many people as you like on your front line. This amounts to more total members in your organization. This type of system is the easiest to grow, very easy to duplicate and very easy to explain. If you really want to make money online with network marketing, you need a company that meets all of this criteria. 2) The product should be a digital or internet-based product or service. 3) The commission structure should be a unilateral or unilevel system. Of course, we all have or own preferences, and just because a company doesn’t meet one or all of the above criteria, does not mean it isn’t worth your time. If you’d like to learn more about other types of network marketing companies, products and commission structures, you can download my free e-book entitled “Network Marketing Survival”. It gives straight to the point, no nonsense information about the mlm industry, and how to choose a company and product that is right for you. With that said, no matter what company you decide to join, always research every opportunity, to make sure it is right for you.